The Columbus restaurant entrepreneur has announced two new restaurant concepts for 2014: a “polished casual” American grill at the Lane in Upper Arlington and an “upscale casual” steakhouse in a Gahanna barn that once was home to Hoggy’s Restaurant & Catering. Neither restaurant has a name yet, but their working names are “the Grille” and “the Barn,” Mitchell said yesterday, smiling. “Restaurants are such a part of the social fabric of a city,” said Mitchell, founder of several iconic local restaurants, including Cameron’s American Bistro, Cap City Fine Diner & Bar and M at Miranova, not to mention national chain Ocean Prime. When Mitchell and his colleagues opened the Pearl Restaurant, Tavern & Oyster Room in the Short North this year, it was the first new concept for the restaurateur since the economy took a nosedive in 2008. Early that year, he completed the sale of Mitchell’s Fish Market, Columbus Fish Market, Mitchell’s Steakhouse and Cameron’s Steakhouse restaurants (22 restaurants in all) to Ruth’s Chris Steak House for $94 million. The deal helped Mitchell repay investors and his restaurants to weather the recession. Now, the restaurant company is growing again. Cameron Mitchell Restaurants plans to open Rusty Bucket restaurants (in which Mitchell is a partner) in the Cincinnati area in the fall; in Naples, Fla., in January; and “a couple in Detroit” next year, Mitchell said. The company and its partner opened a Rusty Bucket in Easton last week and are renovating the menus and facilities of existing Rusty Bucket restaurants, he said. The company also plans to open another Ocean Prime upscale seafood and steak restaurant in Philadelphia in September, and one in Beverly Hills, Calif. — its first foray into California — in April. The new restaurant concepts were developed to occupy unique properties that became available, Mitchell said. 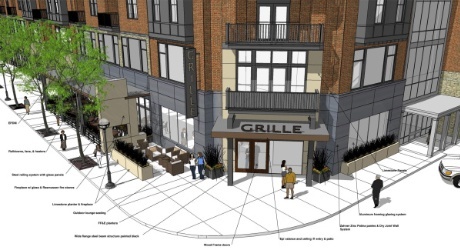 The Grille, set to open in February, will be a “cleaned-up version of our Cap City, which has been very successful for us,” he said. The menu will focus on fine wines by the glass, appetizers, flatbreads, rotisserie meats and entree salads, with a couple of fish and prime steak dishes, he said. No white tablecloths here. “It will be warm and cozy,” he said. The Barn, planned for a spring opening at the Market at Roger’s Corner shopping center on Johnstown Road, will offer “an extensive bourbon selection” as well as a butcher shop, bake shop and smokehouse that will supply the open kitchen, in which customers can view their food being prepared. The menu will be “very approachable,” he said, with Black Angus steaks; house-smoked chicken, ribs and pork chops; and freshly baked Parker House rolls and pies served family style. Mitchell is smart to target the “polished” or “upscale” portion of the casual-restaurant segment, said Darren Tristano, executive vice president of Technomic, the Chicago restaurant- and food-research firm. The restaurant and food analyst isn’t surprised to see more new concepts from Mitchell and his restaurant company. This entry was posted on Monday, June 24th, 2013 at 8:04 am and is filed under Growth, Polished Casual, Upscale Casual. You can follow any responses to this entry through the RSS 2.0 feed. You can leave a response, or trackback from your own site.